Remember getting boxes of colorful conversation heart candies for Valentine’s Day? 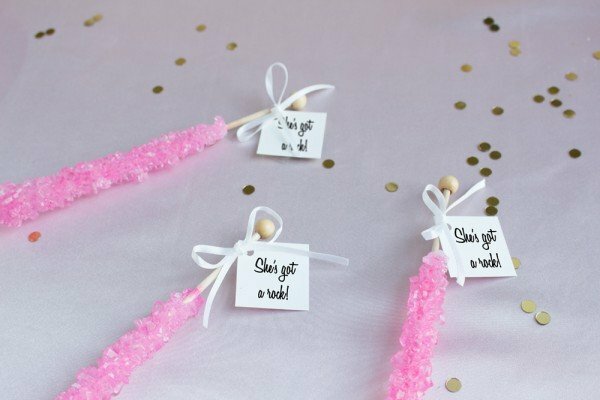 These seasonal treats bring back such fun memories and we couldn’t help but notice how pretty and fun they are with their pastel colors and sweet and funny messages. That’s exactly why we knew a DIY project about them would be the perfect craft for Valentine’s Day! These ended up being so simple to create and we instantly knew that these would make great decor for a night in with your Valentine or a Galentine’s Day event. (We’re also adding these to our Thoughtful and Romantic Valentine’s Day Gifts list!) 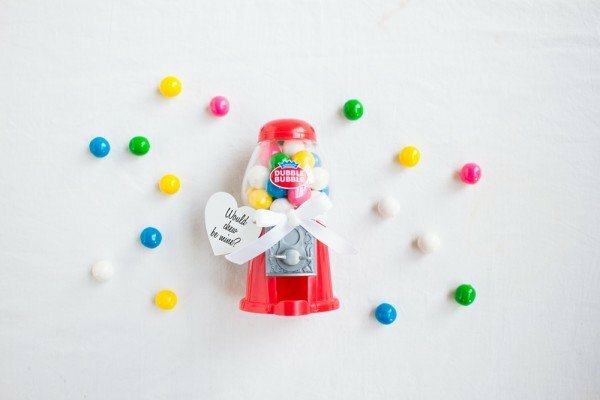 Plus, even though they’re made with Valentine’s Day in mind, they’re cute enough to use all year long. 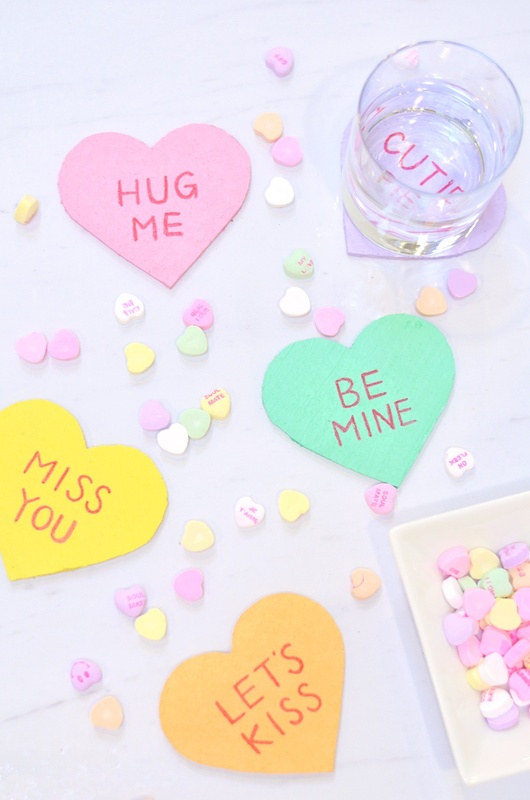 Keep reading to see how you can create you own conversation heart coasters! First use a heart-shaped stencil to trace out a heart onto your cork sheet and use your craft knife to cut the shape out. 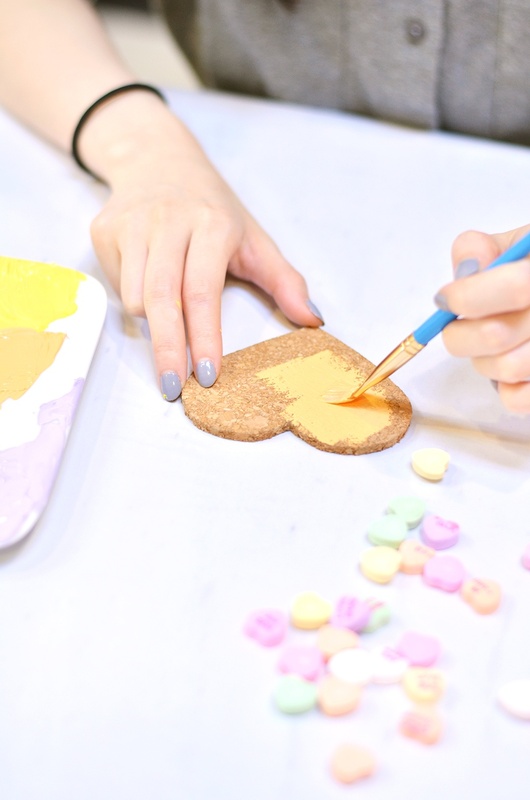 Next, mix white paint with another color (conversation hearts come in white, purple, orange, pink, yellow, and green) to get that classic pastel shade of the candies. 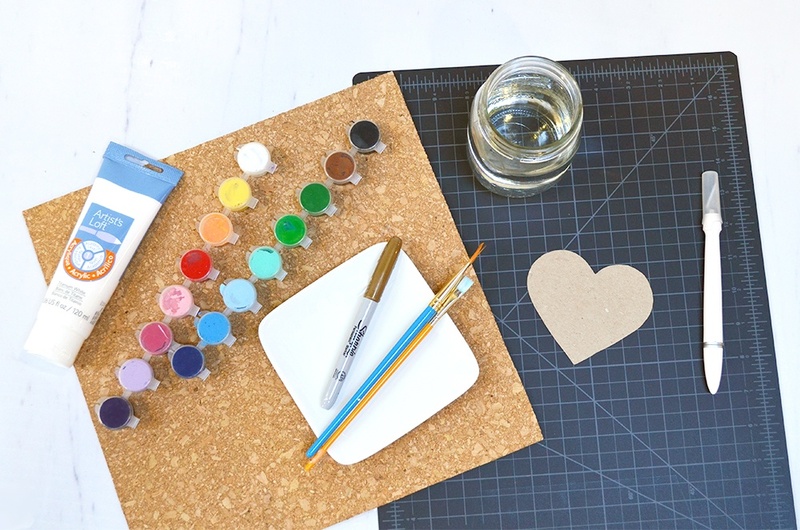 Use a paint brush to paint both the edges and one side of the cork heart, then let the paint dry completely. Once dry, use a red marker to write a common conversation heart phrase such as “Hug Me”, “Be Mine”, or “Lets Kiss”. That’s it! Don’t forget to watch our step-by-step video for more visual instructions and please, let us know how your coasters turn out! Happy Valentine’s Day!